Leonara Jaksen bathed, fed and changed her son Nicholas every day for 22 years. At night she would wake every two to three hours to turn him over in bed to ease his discomfort. Caring for Nicholas, who has quadriplegic cerebral palsy and is unable to hear or speak, was a relentless full time job and it was driving her to despair. "My doctor said if he's not put in care it will be an emergency for my health," she said. "I was ready to collapse." 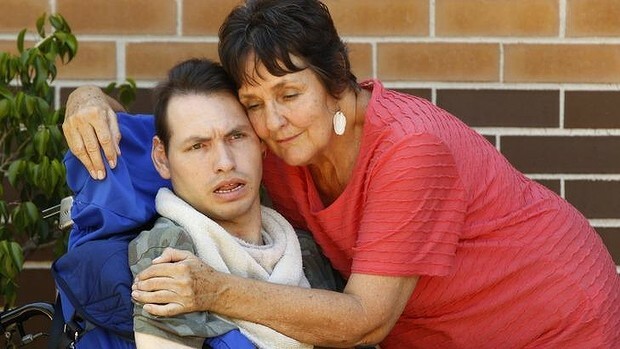 Nicholas, now 32, moved into a NSW government-run facility in Summer Hill staffed by highly qualified specialists offering 24-hour a day care seven days a week. He has his own room, can attend day programs during the week and go on group outings at the weekend. The quality of care is "gold standard", Ms Jaksen said. Ms Jaksen, and many of the 90,000 elderly and disabled people who receive state government care, have been alarmed by a decision to transfer services to the non-government sector from 2015. The Home Care Service of NSW will be the first division of Ageing, Disability and Home Care (ADHC) to go private ahead of the roll out of the NDIS which promotes more competition in the sector. The state government will release the tender to private providers early next year with names which have been bandied about include health giant Bupa and Serco, best known in Australia for operating detention centres. It's a proposition that terrifies Ms Jaksen, who is concerned a private for profit provider will be more interested in serving the needs of shareholders than those of the severely disabled. "The doctors told me Nicholas would be dead by the age of 12," she said. "He has outlived his life expectancy and that's because of the highly trained staff and the high standard of care he receives. No non-government organisation is ever going to be able to offer those services. The dollars just won't be there." Kenthurst mother Ingrid Pickering shares such fears. Up until two years ago, she and her husband were caring for their intellectually disabled son Michael at home until his violent outbursts became too much for them to cope with. "He was rejected by every non-government organisation because they just couldn't handle him," she said. "Our house looked like Swiss cheese. He punched holes in every wall. I was being hit constantly. My husband was being hit. We would be kept up all night. He head butted me and broke my nose, broke my front teeth." Since Michael, 30, moved into a state-run small group home in Wahroonga he has been happier and has built strong relationships with the staff and his housemates. She fears a for-profit provider will not be able to manage Michael's extreme behaviour and quality standards will suffer. "I can see a decline in care," she said. "If they are going to make a profit, the easiest way to do that is to reduce staff." Like many parents of children with a disability, Mrs Pickering welcomed the announcement of the NDIS but now she is concerned the scheme is being used as an excuse by the state government to opt out of care provision entirely. She has started a petition on change.org which has attracted almost 13,000 signatures. "This is cost shifting exercise under the guise of the NDIS," she said. Ageing, Disability and Home Care is the largest single provider of services for the disabled and elderly in NSW, comprising 40 per cent of the sector. A large proportion of those receiving care are over 65 and not eligible for NDIS support, raising concerns about a potential increase in costs. Pensioners currently pay about $11 an hour for home assistance, which can include help with housework, shopping and personal care. The Combined Pensioners and Superannuants Association of NSW has fielded numerous calls from older people concerned they will be priced out of home care if a for-profit provider comes in. Carers Alliance secretary Mary Lou Carter questioned why both the government and some community providers are dropping services when NDIS support won't be widely available for another four years. "There is a lot of concern around withdrawal of services even before the NDIS is under way," she said. "It's not just home care. A lot of families have told us they can't get respite care and the service provider has told them it's because the NDIS is coming but the full roll out is many years away so what are people supposed to do in the interim?" People with Disability Australia president Craig Wallace believes the state government is acting with undue haste. "They are getting out of the space as quickly as they can and they are not thinking about what happens to those people before the NDIS comes in," he said. "I am worried there is a gap some of our people will fall through. I don't think they should withdraw those services until the NDIS is rolled out completely and they have been discharged of their responsibilities." Mr Wallace can see some positives in the transfer of state-run services to the private sector, such as the closure of large institutions for the disabled, and dismisses a Public Service Association campaign against the change as scaremongering. More than 1000 people turned up to a PSA-organised rally to vent their anger about the change, many of whom were care workers distressed about their forced transfer to the private sector. "ADHC provides the bulk of services and looks after the vast majority of clients with very high needs," PSA assistant general secretary Steve Turner said. "They require a lot of support and that is expensive. Will a private provider give them the same level of service if it's not profitable for them to do so? The state government cannot guarantee that level of service will be replicated." The PSA has also raised the prospect of more than $800 million worth of government-owned property used to house people with disabilities being included in the handover to the new operator. The government has not yet decided on the future of the property but NSW Minister for Disability Services John Ajaka has denied the land will simply be donated. Mr Ajaka has publicly assured care recipients that the transfer will not affect their supports and the new provider will have to abide by existing fee guidelines. Serco, while not confirming its interest in the tender, is optimistic about its ability to deliver with a spokesman saying: "We are always keen to explore how we can do more to help provide quality public services to people in the state." Mary Lou Carter is not entirely convinced. "The private sector does amazing things and is a leader in innovation but there is always a core group of people for whom the private sector cannot provide services," she said. "There will always be hard cases. Are the hard cases the ones which are going to be thrown on the scrap heap? Who will provide the safety net if not the government? We don't want the most vulnerable of our citizens to end up in no man's land."